Arriving at the Hotel Edelweiss & Gurgl in the ski resort of Obergurgl in Austria on a cold January evening was anything but dreary. The metres of crisp snow, bathed the whole town in twinkly vitality – streetlights reflecting white, yellow and more from the snow. As we stepped out of our taxi and looked up at our home for the next few days, my heart soared. Standing proud against the dark night sky, the beautiful white ripples of snow outlined the attractive alpine architecture the of the Hotel Edelweiss & Gurgl. After checking in we quickly checked out the hotel’s facilities, starting with our spacious room, which was something of a junior suite – with a seating area with sofa and dining table. 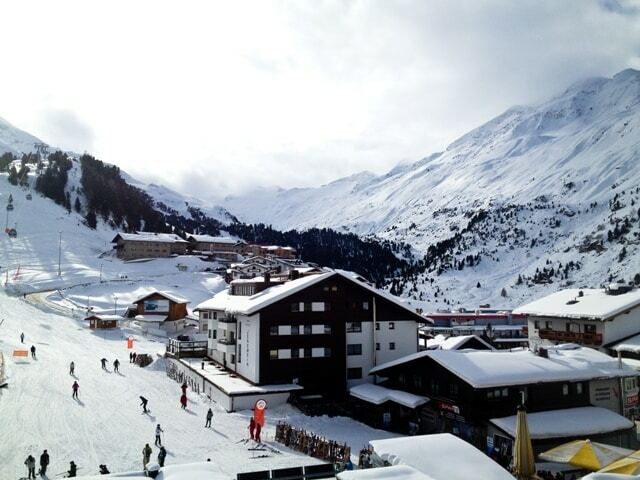 Great views are always welcome and we had wonderful vistas of Obergurgl’s mountain ranges and ski runs from the four-star ski hotel. Stepping out onto our balcony offered up even greater views, even if it was a bit too cold to stay out there for long. 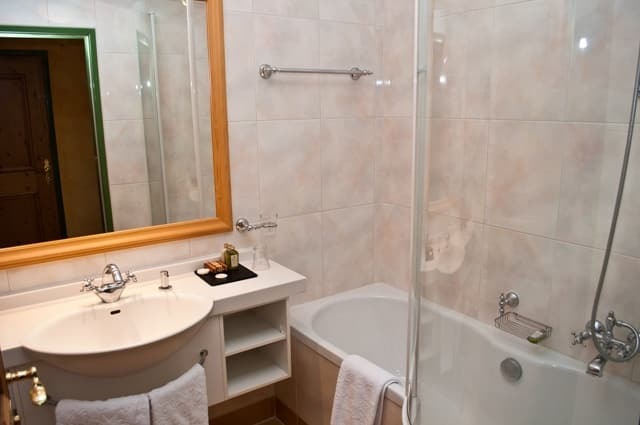 The room itself was warm, inviting and well-equipped with plenty of wardrobe and shelf space, flatscreen TV, dining table and chairs, separate bathroom and toilet, as well as fluffy bathrobes and a spa basket, with towels for use in the hotel spa. 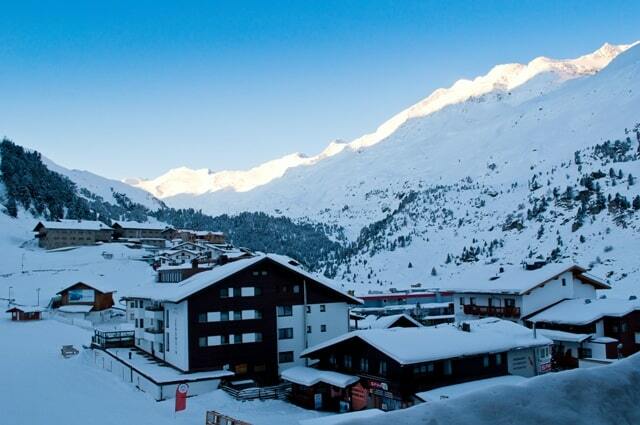 The town of Obergurgl stands at over 1,900 m or 6,330 ft above sea level and is an ideal skiing and snowboarding location. 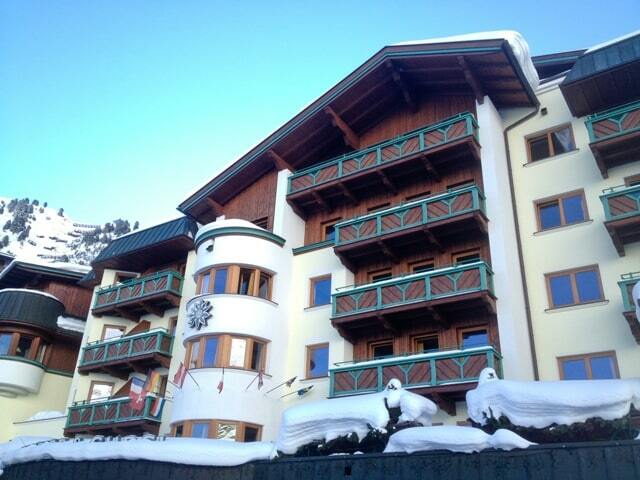 And the Hotel Edelweiss & Gurgl which dates back to 1889, has a perfect location right next to the ski lifts. 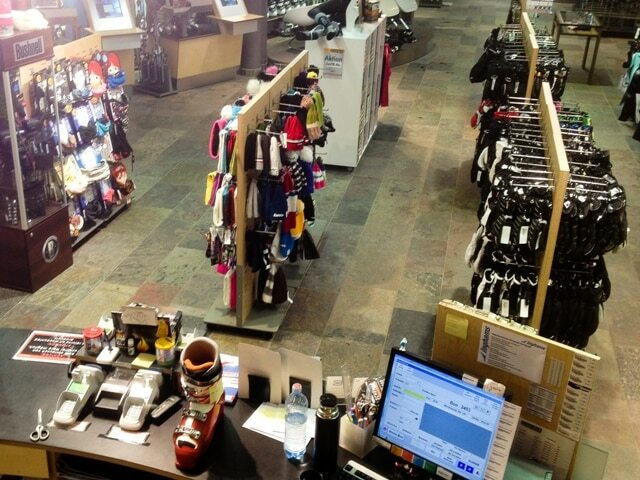 Attached to the hotel is the Scheiber Sports Shop which sells and rents all the equipment you could possibly need for skiing and snowboarding. 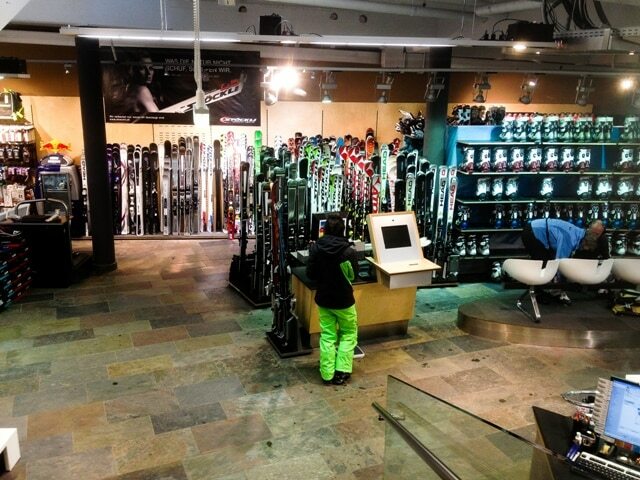 While the hotel has a great ski and boot room where you can leave your gear. Following a day’s skiing, it seemed only right to hit to the hotel’s outdoor bar for some aprés ski. Snuggling under a giant umbrella, we sipped gluhwein, jagertees (a tasty but rather lethal combination of Jägermeister, schnapps and tea) and beers. 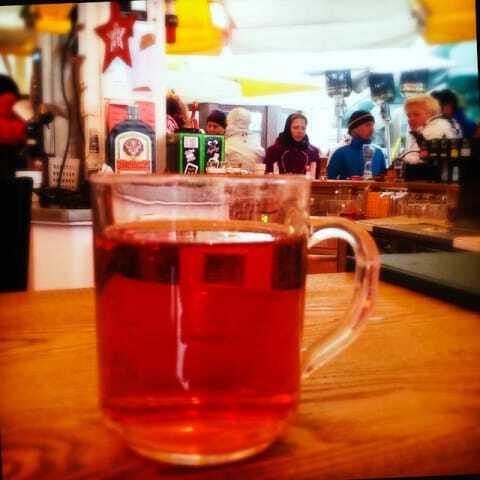 We drank as the snow fell and as tales of a great day on the mountain were shared, it seemed appropriate to toast our good fortune to be in Obergurgl. Early evening, we put on our robes and slippers, and made our way to the Hotel Edelweiss & Gurgl’s extensive spa. 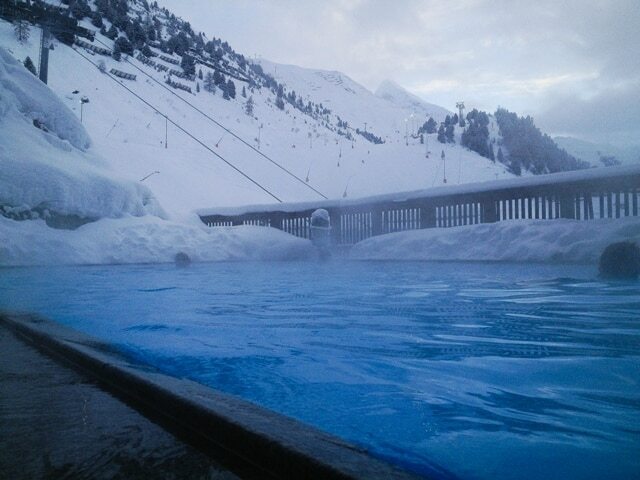 As dusk descended, we glided into the indoor/outdoor pool and swam beneath the quiet though unrelenting snowflakes that had started to tumble from the sky. This tranquil setting stood in stark contrast to the colour and vibrancy of the skiers that had thronged the mountain and valley during the day. Heading into the elaborate spa area we were impressed at the extent of our well-being choices – there was a Finnish sauna, ice room, laconium, sauna, steam room, infra-red cabin, and relaxation areas. One evening there was even a Hotel Edelweiss & Gurgl spa night, where prosecco was laid on for those enjoying a late night swim and the relaxation areas with loungers and even water beds. 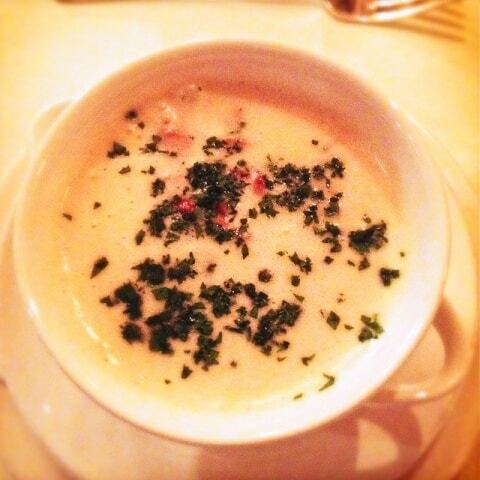 For us, a great feature of the Hotel Edelweiss & Gurgl was that it sourced its food from the local farming community. Each meal we had there was first rate. I don’t consider myself a great foodie, but even I had to acknowledge the fabulous quality of the meals. The staff at the Hotel Edelweiss & Gurgl were friendly, efficient and very helpful. On the two occasions that we sought specific help they went the extra mile to assist, all of which ensured our lovely stay in Obergurgl was made even more memorable.